2020 Jeep Gladiator First Drive Review: Are You Not Entertained? Jeep’s latest pickup offers best-in-class performance with legendary Jeep capability. Jeep hasn’t built a pickup truck since 1992 when the last-generation Comanche went out of production. Fans have been begging for a replacement ever since, and thanks to the flexibility of the new Wrangler’s architecture and a rise in demand for midsize trucks, Jeep has returned with the all-new, 2020 Jeep Gladiator. We recently had a chance to drive the new truck both on and off road around Sacramento, California. The performance stats are impressive, but does the Gladiator live up to the hype and is it a proper Jeep? At first glance, the 2020 Jeep Gladiator is just a Wrangler with a pickup truck box attached. While technically more than that, the JL Wrangler heavily influenced the design of the Gladiator. The rear doors, and everything further forward, is a carryover from the Wrangler. That means they’re using the same fenders, the same windshield, and the same headlights. The only difference is the grille on the Gladiator allows for more airflow to the engine. The box of the truck both separates the Gladiator from the Wrangler and comes packed with some clever features. For example, the side of the bed is low enough so a person could reach in to touch the bed floor. That means a normal human can get cargo in and out without a step or having to step on the wheel. What a novel concept! The tailgate is aluminum and damped for easy opening and closing and can also open up 45-degrees and remain fixed for loading larger cargo items. The spare tire Is located underneath the bed, and on Rubicon trims can even hold a spare tire 35-inches in size. Like all Wranglers, the Gladiator roof is removable. The standard top is a zipper-less soft top. Buyers can also opt for either a black 3-piece hard top or a body-colored top. The new power-operated top on Wrangler isn’t available on Gladiator. Rubicon versions get bigger wheels, optional mud terrain tires, and rock rails that also protect the bed from damage. Gladiator is powered by FCA’s 3.6-liter Pentastar V-6 engine making 285 horsepower and 260 lb-ft of torque. All trims come with a 6-speed manual transmission as standard, with an optional upgrade to the 8-speed automatic. Coming soon is a new version of FCA’s EcoDiesel making 260 horsepower and 442 lb-ft but availability information hasn’t been released - it's worth noting the diesel won't be available with a stick. 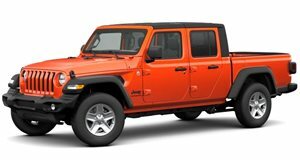 The EPA rates the Jeep Gladiator at 16 mpg city, 23 mpg highway and 19 mpg combined for the manual. The automatic comes in at 17 mpg city, 22 mpg highway and 19 mpg combined. Our time was spent mostly in the automatic Overland trim, and in mixed driving, the onboard computer reported 19.5 mpg. Since the Gladiator is a truck, towing is an important metric. Gladiator offers best-in-class gas towing up to 7,650 pounds when properly equipped. The only truck that beats Gladiator is the Colorado with the diesel engine, and only when in two-wheel drive configuration. The Gladiator only comes in four-wheel drive. If you have spent any time in the JL Wrangler, you’ll feel right at home with Gladiator. The interior uses many of the same components and shares similar dimensions. Gladiator’s carpet can be completely removed for hosing out the interior. Additionally, Gladiator has rear storage under the seats that are lockable. There is 49.2 cubic feet of seat volume in the back of the crew cab. The rear seats have their own air vents and there are four USB ports in the back, including two of the new Type-C ports. Jeep’s latest version of Uconnect is also available with two different system screen sizes. Both the seven- and 8.4-inch screens support Android Auto and Apple Car Play, plus have specific Off-Road pages that show vehicle angle and features enabled. The backup camera is the highest resolution I’ve seen in a midsized pickup truck and hopefully, it makes its way across the entire FCA lineup. The flat windshield and upright design of the dash does make the interior feel a bit small up front, while the Ranger and Colorado feel airier. I was still able to find a comfortable driving position but still felt close to the steering wheel. Like the Wrangler, the Gladiator’s doors can be removed and the front windshield can fold down. Jeep includes a toolkit with purchase with everything you need to perform the conversion. A five-foot box is the only bed length on Gladiator, which means there’s 35.5 cubic feet total of volume in the box to put stuff. Longer items can be accommodated by using the tailgate in its 45-degree position or opening it entirely. Buyers can also purchase a tonneau cover from Jeep to help enclose that cargo area. Like many pickup trucks, though, we expect there to be a huge aftermarket selection of both covers and truck caps for those who are interested. Our time spent with an Overland trim automatic was well spent. On the highway, the Gladiator has a nicer ride than an FX4-equipped Ford Ranger, with less bounce from the suspension over bumps. The solid front-axle, while great off road, does affect steering feel and feedback. It’s not nearly as precise as trucks with an independent front suspension. It’s not a sports car, though, so it’s not as big of a demerit. I’m not sure non-Rubicon trims need a solid front axle but offering different options would add complexity to the manufacturing process and likely increase cost. Behind the wheel, you can’t even tell you’re driving a pickup because everything around you is straight from the Wrangler. The Pentastar V6 is responsive, as is the eight-speed automatic. Compared to the Colorado and Tacoma, the Gladiator has a superior powertrain. The best engine and transmission offering in this class, though, comes from the new Ford Ranger with the turbocharged engine and 10-speed automatic. Gladiator also towed a 5,000-pound boat confidently, though I didn’t notice any specific towing setting for the transmission. According to the build-and-price tool, Jeep has an optional trailer brake controller. I’d recommend checking that box for the added safety it offers. It should also be mentioned that the soft top, while easy to remove, is a bit loud inside when it’s closed. Wind and road noise make it pretty loud inside the cabin. Jeep people already know this, but if you’re going to do highway driving regularly, the hard top with headliner is a quieter experience. Our time on the road was with an Overland, but Jeep prepared an off-road course for us with the Gladiator Rubicon. Rubicon adds front and rear axle lockers, along with an electronically disconnecting sway bar. A new Off Road+ setting also adjusts settings for higher-speed off road runs. Our course was slow and technical and didn’t allow for much use of the feature. It had rained the day before, so the course was muddier than expected. Mud terrain tires are available as a no-cost option and were much appreciated during our off-road testing. The added wheelbase of the truck does mean that the center breakover angle isn’t as good, but the added stability on road makes up for it in my opinion. Not once did I reach the breakover point on a very complicated bit of rock climbing. The rock rails protecting the bed come in handy for on the Rubicon. I was climbing down a rock waterfall that was too wet to actually get grip, and the truck slid into a boulder near the rear. If the rock rail wasn’t there, it would’ve been an expensive oopsie. But since they were there, there was no damage at all. The rest of the off-road experience is what you’d expect from something with a Jeep badge on it. It’s as good as a Wrangler off-road, and it is the most capable off-road midsize pickup on sale. The only competition would be the ZR2 Bison from Chevrolet, but the Jeep has a nicer interior and more optional creature comforts. While the truck is all-new, riding on a modified Wrangler platform, many of the components are tried and true on the Wrangler. It shouldn’t experience the new model problems that sometimes can plague a first-year of an all-new car. There are four trims available on Gladiator. All of them include four-wheel-drive. The base Gladiator Sport starts at $33,545. The Sport S is $36,745. The Overland, which is the equivalent of Sahara on Wrangler starts at $40,395. The Rubicon starts at $43,545. All prices don’t include a $1,495 delivery charge. For those who like to check all of the boxes, expect to pay close to $60,000. While technically it’s not just a Jeep Wrangler with a bed, the Gladiator does everything the Jeep Wrangler does and some. The extra utility it provides is well worth the extra price of admission, and if I was looking at a new Wrangler, I’d skip over it and head straight for the Gladiator. If you want the best in class for towing and payload with four-wheel drive, you’re also going to want the Gladiator. While the Ranger has a few merits that I like better than Gladiator, the ride quality of the Overland is better on road than Ranger’s FX4. The capability of the Rubicon Gladiator exceeds everything but the specialized Bison trim of the ZR2. Both Gladiator and Bison will be available with diesel engines, but the solid front axle and disconnecting sway bar push the Gladiator over the top for me and would make it the truck I’d recommend if you intend on doing serious off-roading.